As part of our efforts to support and encourage young Australians in study, careers and volunteering in international agricultural research, the Crawford Fund State Committees proudly support our International Agricultural Student Awards. The 2018 recipients of these Awards were announced in May, and we look forward to sharing the journey of these 22 dynamic Australian tertiary students as they gain international agricultural research experience and expertise. We have previously presented the experiences of University of West Australia student, Christian Berger, Queensland University of Technology PhD candidate, Thomas Noble, and University of Melbourne student, Kimberly Pellosis. Now, thanks to The Crawford Fund NSW Committee, we provide this summary of University of Sydney student, Luisa Olmo, and her experience in Cambodia and Hong Kong. Like the three previous students, Luisa was connected to an ACIAR project. 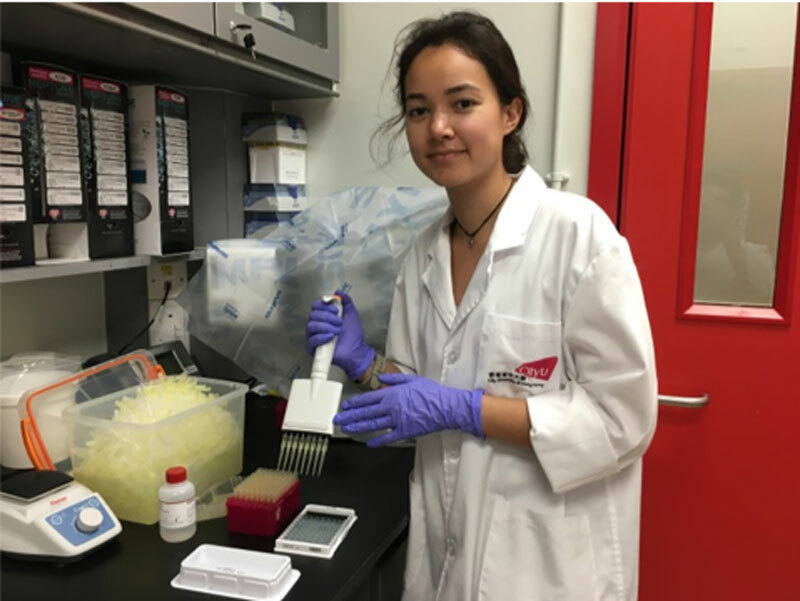 “I travelled to Cambodia and Hong Kong to collect and analyse cattle and buffalo serum samples for reproductive pathogens thanks to the Crawford Fund Student Award,” said Luisa Olmo, a third year PhD student investigating reproductive efficiency in smallholder cattle and buffalo in Laos and Cambodia, with the Mekong Livestock Research Team at the University of Sydney. “In 2016, our team screened 160 Lao cattle and buffalo serum samples for reproductive pathogens potentially causing reproductive failure, facilitated by the College of Veterinary Medicine and Life Sciences (CVMLS) at the City University of Hong Kong,” said Luisa. The preliminary analysis revealed 70% seroprevalence of Neospora caninum in buffalo and exposure to Leptospira interrogans serovar Hardjo and bovine viral diarrhoea virus (BVDV) in cattle which were most prevalent in provinces heavily involved in provincial and cross-country trade. With similar risk factors being present in Cambodian smallholder livestock systems, a similar investigation was deemed essential. 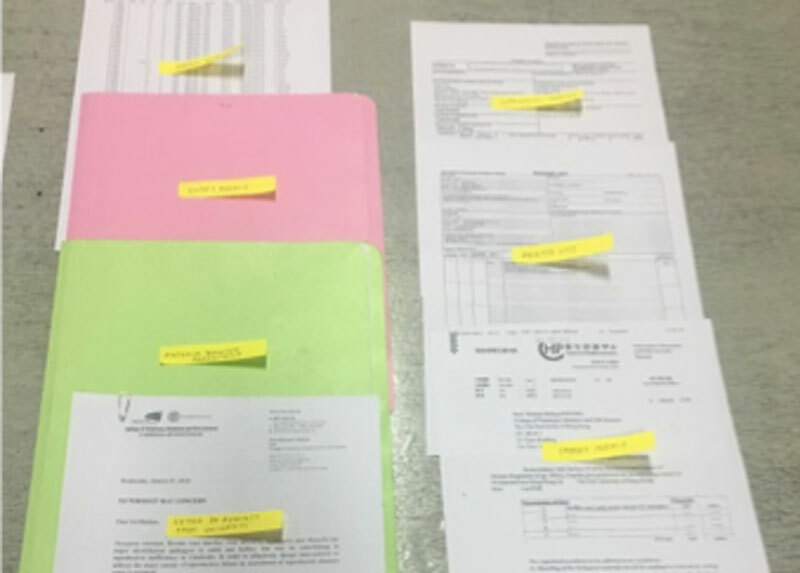 “We received permission from the General Directorate of Animal Health and Production (GDAHP) to export stored serum samples from Cambodia in March. Although the task in Cambodia was wrought with uncertainty, I had a lovely stay in the warm and bustling city of Phnom Penh, enjoyed pleasant lunches with the team, and eventually navigated through the lengthy customs procedure,” said Luisa. “At the City University of Hong Kong I worked in the brand new Veterinary Diagnostic Lab (VDL) learning how to conduct enzyme-linked immunosorbent assays under the supervision of Postdoctoral fellow Dr Lloyd Wahl, and during my stay we analysed 500 samples for antibodies against N. caninum, BVDV and Brucella abortus revealing an overall seroprevalence of 9%, 6% and 0%, respectively,” she said. This analysis is essential to understanding possible disease causes of reproductive inefficiency, which is problematic in smallholder production. Baseline data and investigations are needed to prevent disease transmission; and to improve reproductive efficiency. The testing of these pathogens would not be currently feasible in Laos and Cambodia where research resources are still being developed and priority is given to Foot and Mouth Disease and nutritional investigations. “I also had time to develop and strengthen relationships with academics and students at the CVMLS. I discussed the results first hand with Dean of the CVMLS, Professor Michael Reichel who arranged for me to meet the Chair Professor of One Health, Professor Dirk Pfeiffer and gain his insights into One Health and developing country research,” she said. “I presented a 30 minute seminar to the Centre for Applied One Health Research and Policy Advice and the university posted a news article on its website. This seminar led to discussions with Associate Director of the CVMLS, Dr Richard Brown regarding potential future work on trace elements. Working in the VDL also enabled me to meet with Dr Vidya Bhardwaj who shared her insights on her previous work in Laos,” she said. “The trip proved to be a valuable learning and networking experience that established new research protocols between institutions and determined baseline prevalence data in Cambodia. I am now statistically analysing the results to determine trends that will hopefully contribute to biosecurity knowledge in the region,” concluded Luisa. Luisa presented her research findings, “Investigation of infectious reproductive pathogens of large ruminants: are neosporosis, brucellosis, leptospirosis and BVDV of relevance in Lao PDR?” at the recent 30th World Buiatrics Conference held in Sapporo, Japan.